On August 26, 1071 Romanus IV, Emperor of the Eastern Roman Empire (reigned 1068 - 1071) faced Sultan Alp Arslan of the Seljuk Turks (reigned 1059 - 1072) in the Battle of Manzikert. The battle ended in humiliating defeat and capture for Romanus. As a result the Empire temporarily lost control over most of Asia Minor to the invading Seljuk Turks. It would regain its control over Asia Minor during the reign of Alexius I Comnenus, (reigned 1081 - 1118). But early in his reign Myra was overtaken by the Islamic invaders. Taking advantage of the confusion, sailors from Bari, Italy seized the remains of the saint over the objections of the Orthodox monks. Returning to Bari, they brought the remains with them and cared for them. The remains arrived on May 9, 1087. Some observers have reported seeing myrrh exude from these relics. According to a local legend, some of these remains were brought via three pilgrims to a church in what is now Nikolausberg in the vicinity of the city of G�ttingen, Germany, giving the church and village its name. But for many children, Nikolaus also elicited fear, as he was often accompanied by Knecht Ruprecht, who would threaten to beat, or sometimes actually eat the children for misbehaviour. Knecht Rupert furthermore was equipped with goatlegs. In Switzerland, where he is called Schmutzli, he would threaten to put bad children in a sack and take them back to the Black Forest. In other accounts he would throw the sack into the river, drowning the naughty children within. These traditions were implemented more rigidly in Catholic countries such as Austria. In highly Catholic regions, the local priest was informed by the parents about their children's behaviour and would then personally visit the homes in the traditional Christian garment and threaten to beat them with a rod. In parts of Austria, Krampusse, who local tradition says are Nikolaus's helpers (in reality, typically children of poor families), roamed the streets during the festival. They wore masks and dragged chains behind them, even occasionally hurling them towards children in their way. These Krampusl�ufe (Krampus runs) still exist, although perhaps less violent than in the past. In the Czech Republic and Slovakia, Mikul� is often also accompanied by an angel who acts as a counterweight to the ominous Knecht Ruprecht (čert). In Slovenia Saint Nikolaus (Miklav�) is accompanied by an angel and a devil (parkelj) corresponding Austrian Krampuss. In Luxembourg "Kleeschen" is accompanied by the "Houseker" a frightening helper wearing a brown monk's habit. In Croatia Nikolaus (Sveti Nikola) who visits on Saint Nicholas day (Nikolinje) brings gifts to children commending them for their good behaviour over the past year and exhorting them to continue in the same manner in the year to come. If they fail to do so they will receive a visit from Krampus who traditionally leaves a rod, an instrument their parents will use to discipline them. In the Netherlands, Saint Nicholas' eve is the occasion for gift-giving, when his alleged birthday is celebrated. In this case, roles are reversed, though, in that Sinterklaas is the one who gives the presents. In recent years, Christmas (along with Santa Claus) has been pushed by shopkeepers as another gift-giving festival, with some success, although, especially for young children, Saint Nicholas' eve is still much more important than Christmas. On the evening of December 5, Sinterklaas brings presents to every child that has been good in the past year (in practice to all children). Sinterklaas wears a red bishop's dress including a red mitre, rides a white horse (called Amerigo) over the rooftops and is assisted by many mischievous helpers with black faces and colourful Moorish dresses, dating back two centuries. These helpers are called 'Zwarte Pieten' (black Petes). Originally Sinterklaas or Sint-Nikolaas was only celebrated in Flanders and the Netherlands the way described above, but now he is celebrated in Wallonia in the same way. The celebrating of Saint-Nicholas is mostly the same as in the Netherlands, but in Belgium the children receive their presents on the 6th of December (though some regions also have the presents on the 5th). Children have to put their shoes by the stove the evening of the 5th of December and the next morning, they find their presents. This tradition was still alive thirty years ago in the Catholic south of The Netherlands. Old picture of St Nicolas in Cl�rey-la-C�te (Lorraine/France)Note that Saint Nicholas has been celebrated in Belgium for centuries - there is even a city called Sint-Niklaas - but, like every folkloristic thing in Belgium, there might be small differences, and generally in the eastern part of the provinces West Flanders and East Flanders Saint Nicholas is not celebrated, but instead children receive presents from Sint Maarten (Saint Martin) on the 11th of November. Saint Nicholas is also celebrated by the university students in the city of Li�ge. In France, Saint Nicolas is only celebrated this way in the eastern part of the country (Alsace, Lorraine regions) and less strongly in the northern part of the country (Nord d�partement). He is accompanied by "P�re Fouettard", carrying a bunch of sticks with which naughty children are beaten. In Portugal, St. Nicholas (S�o Nicolau) has been celebrated since the Middle Ages in Guimar�es as the patron saint of high-school students, in the so called Nicolinas, a group of festivities that occur from November 29th to December 7th each year. In Bari, where St.Nicholas (San Nicola) is buried, the saint is the patron of the city and its very felt celebration is called Festa di San Nicola, is on the 7-8-9 of May. In particular on the 8th of May the spoils of the saints are carried on a boat on the sea in front of the city with many boats following (Festa a mare). In December 6th there is instead a ritual called Rito delle nubili. In Trieste St. Nicholas (San Nicol�) is celebrated with gifts given to children the morning of the 6th of December and with a fair called Fiera di San Nicol� during the first weeks of december. Depending on the cultural background, in some families this celebration is more important than Christmas. Trieste is a city on the sea (sailors) that was one of main ports of Austro-Hungarian_Empire and has mainly italian, slovenian and german culture but also greek and serbian. May be this explains why it is one of the few cities in Italy that celebrates St.Nicholas in December. Benjamin Britten wrote a Christmas cantata commissioned by three public schools. 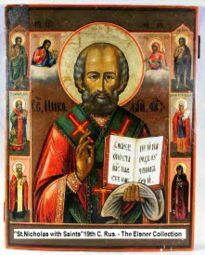 This tells the story of Saint Nicholas and his Christian exploits. This is for small orchestra, three choirs, a tenor soloist (St. Nicholas), and a treble (young Saint Nicholas). Noel Baba at the square in front of the church.The metamorphosis of Saint Nicolas into the commercially more interesting Santa Claus, which took several ages in Europe and America, has recently been reenacted in the Saint's home town, the city of Demre. This modern Turkish city is built on the ruins of ancient Myra. As St. Nicholas is the most important Russian Orthodox saint, the city attracts many Russian tourists. A solemn bronze statue of the Saint by the Russian sculptor Gregory Pototsky, donated by the Russian government in 2000, had been given a prominent place on the square in front of the medieval church of St. Nicholas. In 2005, mayor Suleyman Topcu had the statue replaced by a red-suited plastic Santa Claus statue, because he wanted the central statue to be more familiar to visitors from all over the world. Protests from the Russian government against the disgrace were only successful to the extent that the Russian statue returned, without its original high pedestal, in a corner near the church.